The SIGMA TC3 System design is the most constrained device available within the P.F.C. 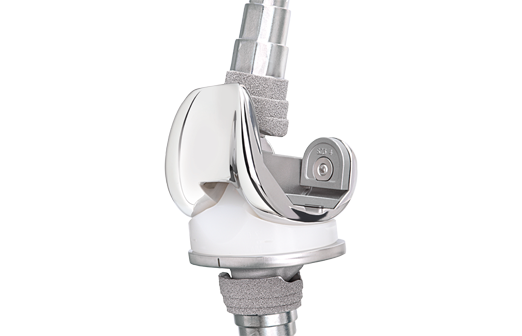 SIGMA Knee System and is indicated for use in cases where collateral ligaments are deficient. This comprehensive system offers both a fixed bearing and rotating platform option. Additionally surgeons are able to address bone and soft tissue defects with a variety of products including augments, wedges, stems, and metaphyseal sleeves. This system’s approach to revision knee surgery provides the surgeon with maximum intra-operative flexibility. MBT Revision Tray provides a platform for progressive compensation of bone loss. Designed to compressively load the tibia. SIGMA® High Performance Instruments drive performance through efficiency, precision, and flexibility. It's a system that provides surgeons with one set of instruments, no matter their approach, with the use of a modular delivery system. Quick release controls allow for one-handed instrument positioning, with locking mechanisms that are easy to activate, and color-coded for clear visual identification. The quick connect power pinning system enhances usability.